Pokemon Go's latest event is all about the Hoenn region and the third generation of Pokemon, Niantic recently announced. The event is now live and will continue through Tuesday, January 29 at 1pm PST / 4pm EST / 9pm BST. And yes, that does mean the Hatchathon event is over. During this event, Hoenn Pokemon will appear more frequently in the wild, and you'll have a better chance of hatching them from 7km Pokemon eggs (which can only be obtained from gifts). A few special Pokemon will appear too, including shiny versions of Zigzagoon and Taillow (you can find tips for catching all the critters on the Pokemon Go shiny list here). Additionally, evolving a Shroomish into a Breloom during the event will grant it the unique move Grass Knot, which, like Low Kick, deals more damage to heavier Pokemon. New gear based on Team Magma and Team Aqua of Pokemon Ruby and Sapphire will be also purchasable with PokeCoins, Pokemon Go's premium currency. More importantly, iconic Legendaries Kyogre and Groudon - who we haven't seen since early 2018 - are back as raid bosses. It sounds like Rayquaza is skipping this event, but consider this: Kyogre is back. I don't know what it is, but I've always loved Kyogre's design. 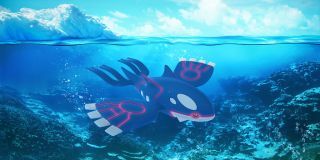 I'm a sucker for water-type Pokemon, but even so, it's just so sleek. I could hardly bring myself to fight it. You can read up on Hoenn Pokemon in our guide to the complete Pokemon Go Pokedex. If you're curious about the history of various Legendaries, head to our Pokemon Go Legendaries guide.